Comprehensive analysis of brain function depends on understanding the dynamics of diverse neural signaling processes over large tissue volumes in intact animals and humans. Most existing approaches to measuring brain signaling suffer from limited tissue penetration, poor resolution, or lack of specificity for well-defined neural events. Here we discuss a new brain activity mapping method that overcomes some of these problems by combining MRI with contrast agents sensitive to neural signaling. The goal of this “molecular fMRI” approach is to permit noninvasive whole-brain neuroimaging with specificity and resolution approaching current optical neuroimaging methods. In this article, we describe the context and need for molecular fMRI as well as the state of the technology today. We explain how major types of MRI probes work and how they can be sensitized to neurobiological processes, such as neurotransmitter release, calcium signaling, and gene expression changes. We comment both on past work in the field and on challenges and promising avenues for future development. SIGNIFICANCE STATEMENT Brain researchers currently have a choice between measuring neural activity using cellular-level recording techniques, such as electrophysiology and optical imaging, or whole-brain imaging methods, such as fMRI. Cellular level methods are precise but only address a small portion of mammalian brains; on the other hand, whole-brain neuroimaging techniques provide very little specificity for neural pathways or signaling components of interest. The molecular fMRI techniques we discuss have particular potential to combine the specificity of cellular-level measurements with the noninvasive whole-brain coverage of fMRI. On the other hand, molecular fMRI is only just getting off the ground. This article aims to offer a snapshot of the status and future prospects for development of molecular fMRI techniques. President Barack Obama established the Federal BRAIN Initiative as a means to “accelerate the development and application of new technologies that will enable researchers to produce dynamic pictures of the brain that show how individual brain cells and complex neural circuits interact at the speed of thought” (Bargmann et al., 2014). Although the President probably did not mean the phrase “dynamic pictures” literally, there is an obvious logic to his choice of visual language. Our species has used images to express complex ideas for at least 20,000 years, and the special potency of images as explanatory vehicles may indeed be hardwired into us. In the neuroscience of today, techniques that literally produce dynamic pictures of the brain — what is often called functional imaging — are increasingly ascendant (Silva et al., 2011; Chen et al., 2013; Rose et al., 2014; Hamel et al., 2015), and they have a particularly important role to play in the continuing exploration of what brains do and how they do it. Few neurotechnologies have been more influential in recent years than fMRI (Rosen and Savoy, 2012; Smith, 2012; Uğurbil, 2012). As practiced in most laboratories and clinics, fMRI involves collecting a series of brain scans from a subject, approximately once a second, and then analyzing the scans for changes from image to image that reflect dynamic brain activity. Because MRI is completely noninvasive and visualizes tissue of any thickness, entire brains or large parts of brains in humans or animals can be studied at once. The signals detected by fMRI usually arise from changes in blood flow (hemodynamics) triggered by neural activity. MRI can be sensitized to these changes either by injecting magnetically active molecules called contrast agents into the bloodstream, as was done in the very first fMRI experiments (Belliveau et al., 1991), or by choosing imaging conditions that allow direct detection of intrinsic vascular changes. So-called BOLD fMRI is performed under conditions sensitive to local concentrations of deoxygenated blood, which is itself magnetically active (Kim and Ogawa, 2012). BOLD fMRI is currently the most common technique for human functional brain imaging and is applied in thousands of studies each year. Despite the popularity of mainstream fMRI methods, limitations of these techniques have been widely recognized (Constable, 2006; Jasanoff, 2007; Logothetis, 2008; Glover, 2011). Because brain activity mapping with fMRI depends on neurovascular coupling, resolution at the level of single cells is out of reach. Fundamental limitations on the spatial detail provided by hemodynamic mechanisms may be set by the spacing between capillaries in the brain, ∼50 μm. More importantly, the cellular origins of functional imaging signals are obscured by the fact that many different cells and cell types contribute simultaneously to the observed fMRI data from each 3D volume element in the brain. There is no way to ascertain what balance of excitation, inhibition, or neuromodulation gives rise to localized BOLD responses, or to determine the input-output relationships among areas displaying apparent activation. The temporal resolution of fMRI techniques is also limited by the phenomenology of blood flow; hemodynamic changes are usually delayed and broadened over a period of several seconds, with respect to underlying neural signaling processes. A final drawback of conventional fMRI methods is that the signal changes they detect are quite small. As a result, statistical analysis of repeated trials or stimulus presentations is usually required, leaving the technique prone to false positives and negatives (Bennett et al., 2009). Together, the limitations of hemodynamic fMRI make it a poor tool for dissecting neural function at the level of cells or circuits, even as it remains the premier approach for mapping spatial activity patterns in human subjects and most animals. Not surprisingly, improving on current functional imaging methods is therefore both a major goal and significant problem (Bargmann et al., 2014). Past attempts to address the limitations of fMRI techniques have included empirical characterization of the relationships between BOLD responses and cellular-level signals detectable by electrophysiology or optical imaging (Logothetis et al., 2001; Schulz et al., 2012), mechanistic dissection of the signaling pathways that relate neural activity to hemodynamic changes (Attwell et al., 2010; Hillman, 2014), and mapping of fMRI responses to specific brain stimuli of molecular and cellular origin (Chen et al., 1997; Tolias et al., 2005; Lee et al., 2010a; Desai et al., 2011). Such approaches can facilitate interpretation of functional imaging data, at least in some contexts, but do not provide novel readouts. Functional imaging techniques with improved specificity have been sought by sensitizing MRI acquisition schemes primarily to small blood vessels (Duong et al., 2003), or by trying to tease apart the separate contributions of blood flow, volume, and oxygenation changes to hemodynamic responses using methods, such as “calibrated fMRI” (Hoge, 2012). More radical fMRI approaches have tried to resolve endogenous activity-dependent brain signals arising from nonhemodynamic sources, such as diffusion changes (Le Bihan, 2007), neuronal magnetic fields (Bandettini et al., 2005), and metabolite-dependent spectroscopic signals (Mangia et al., 2009; Hyder and Rothman, 2012). An advantage of such methods is that they can be applied in humans or animals without the need for invasive procedures, but a disadvantage is that most endogenous signals are even smaller than hemodynamic fMRI effects and are therefore difficult to discern unambiguously. There is therefore a persistent need for more robust and mechanistically interpretable approaches to functional brain imaging. An ideal next-generation functional imaging method would be one that could combine the noninvasive whole brain coverage of fMRI with the resolution and molecular specificity achieved by optical functional imaging techniques. Modern optical imaging provides cellular level readouts of neural activity (Hamel et al., 2015). These approaches can penetrate deep into tissue with the aid of multiphoton fluorescence excitation, endoscopy systems, and prisms, although with limited fields of view. For certain small transparent organisms, optical functional imaging can measure every neuron in the brain, with frame rates of 1 Hz or better (Ahrens et al., 2013; Schrödel et al., 2013). At the core of successful optical neuroimaging methods are synthetic and protein-based fluorescent indicators descended from probes first introduced in the 1980s and 1990s (Rose et al., 2014). In the quest to establish next-generation noninvasive imaging techniques, the development of analogous probes detectable by MRI, together with corresponding delivery and readout methods, is of paramount importance. Such probes would enable “molecular fMRI,” a hybrid of molecular imaging with fMRI in which targeted molecular probe-mediated readouts form the basis for functional brain imaging. Molecular fMRI could eventually enable noninvasive functional neuroimaging with molecular specificity to be performed across multiple brain regions in animals ranging from rodents to nonhuman primates, and perhaps even eventually people, but the technology is still in its nascency. The purpose of this Techsights article is to introduce the reader to emerging molecular fMRI methods and to comment on some of the future directions and challenges of this evolving research area. An early form of molecular fMRI was introduced by Alan Koretsky's laboratory in the late 1990s (Lin and Koretsky, 1997). The studies used manganese ions (Mn2+) to label neural populations activated by stimuli during or before imaging. Mn2+ enters depolarized cells through voltage-gated calcium channels and accumulates over time. Because Mn2+ is paramagnetic, it acts as an MRI contrast agent and can be visualized by imaging. Generating sufficient Mn2+-based contrast for activity labeling generally requires stimulation over minutes to hours (Massaad and Pautler, 2011) but can occasionally result in signal enhancements of >100% (Lin and Koretsky, 1997). The resulting contrast patterns spread to some extent between cells and return to baseline over days, limiting both the specificity of labeling and the possibilities for truly dynamic functional imaging. On the other hand, the technique offers advantages in that it is very easy to implement and that Mn2+ labeling can take place in freely behaving animals before imaging, which requires immobilization (Pautler, 2006). The first true molecular fMRI study with temporal resolution approaching the speed of thought was published recently by our group using an MRI contrast agent sensitive to the neurotransmitter dopamine (Lee et al., 2014). The probe is a magnetically active metalloprotein, similar to hemoglobin in the blood, that was engineered to bind dopamine selectively with a dissociation constant of ∼1 μm (Fig. 1A). To map dopaminergic brain activity using this MRI sensor, we injected it directly into rat brains and acquired serial images with a frame rate of 0.13 Hz during intermittent delivery of electrical stimuli to a neural fiber tract called the medial forebrain bundle (Fig. 1B). Across fields of view corresponding to the probe distribution volume of ∼50 μl, we observed maximal signal changes on the order of 1%–3%, similar to typical BOLD response magnitudes, corresponding to stimulus-evoked extracellular dopamine concentrations from 8 to 24 μm. Contributions from probe-independent physiological changes were ruled out using control experiments with a dopamine-insensitive probe. Dopamine imaging results resemble a standard fMRI activation map but denote quantitative measures of an individual signaling molecule, rather than the generic neurovascular changes reflected in BOLD contrast (Fig. 1C). Data reveal a pattern of dopamine release that peaks in the core of the nucleus accumbens, probably reflecting dependence on the reward stimulation site optimized for robust operant behavior in the implanted rats. Molecular fMRI with a probe sensitive to dopamine. A, Structure of the dopamine-sensitive contrast agent BM3h-9D7 (Brustad et al., 2012), showing the paramagnetic heme group that creates MRI contrast effects. Binding of dopamine (blue) to the heme blocks interactions with water molecules (red), turning off the contrast agent by decreasing its r1 value. B, Average time course of molecular fMRI signal changes (green) observed in rat ventral striatum during brain stimulation known to evoke dopamine release (red line), in the presence of BM3h-9D7 (Lee et al., 2014). A control time course (gray) was obtained using the same experimental procedure in conjunction with a probe variant insensitive to dopamine, BM3h-WT. Error bars indicate SEM across 7 animals each. Inset, Coronal slice through a rat brain (bregma +0.7 mm), indicating injection cannula placement (arrowhead) and the area of injection (green circle). C, Map of peak dopamine concentrations (red-yellow) evoked by reward-related stimulation in three slices through ventral striatum. Yellow represents rostrocaudal coordinates. White represents brain atlas. Green outline indicates area of contrast agent coverage. Gray underlay is an anatomical image. A, Adapted from Brustad et al. (2012). B, C, Adapted from Lee et al. (2014). The dopamine imaging study represents a landmark in the development of molecular fMRI. Even in its current crude and relatively insensitive form, the technique offers spatial and temporal resolution far in excess of the previous state-of-the-art dopamine functional imaging methods based on PET (Laruelle et al., 1997; Laruelle, 2000). Further room for improvement is there as well: the theoretical resolution limit of MRI is <10 μm, and some previous functional imaging studies have been performed with a combination of 0.05 μl voxel volume and 20 Hz frame rate (Yu et al., 2014). With advances in molecular probe technology, one could imagine a future in which molecular fMRI is used to determine brain-wide neurochemical maps corresponding to a universe of stimuli and behavioral programs. In animals and eventually people, such methods might provide fundamental insights into the relationships between neurotransmitter release patterns and cognitive phenomena, affective states, and diseases, with resolution perhaps approaching the level of individual cells. One can also imagine variants of the technique that sense other transmitters, such as glutamate, GABA, and glycine, as well as major intracellular signaling molecules, such as calcium ions, cyclic adenosine monophosphate, and inositol triphosphate, vastly increasing the number of potential biomarkers for both basic scientific and clinical studies. In short, there could be noninvasive MRI-based analogs for each of the most powerful optical neuroimaging approaches currently available to researchers. But the technological hurdles on the way to realizing this vision are almost as significant as the potential rewards (Lelyveld et al., 2011). There are several areas where improvements are necessary: Most obviously, more effective and minimally invasive methods for delivering imaging agents to large brain volumes must be sought. For imaging of intracellular targets, developing probes that permeate cells and localize cytosolically is important (Zhang et al., 2007; Lee et al., 2010b), and for eventual applicability of molecular fMRI in people, finding a way to get contrast agents across the blood–brain barrier (BBB) will also be essential. In addition, probes that provide better sensitivity to molecular targets in the brain must be developed. Most signaling molecules are present at nanomolar concentrations in tissue, but the existing molecular fMRI sensors must be present at micromolar levels to provide detectable signal changes (Lelyveld et al., 2011). This increases the requirements for effective probe delivery, allows only very high levels of neurotransmitter to be detected, and raises the chances that the probes interfere with the very signaling pathways they are designed to measure. The development of improved probes with submicromolar sensitivity to analytes is the single most significant frontier in the further development of molecular fMRI. What are the best strategies by which to accomplish this? To consider the possible routes forward, we need to dive into the physics and chemistry of MRI molecular imaging agents. In the next sections, we briefly describe the properties of major classes of MRI agents, and we then incorporate this information into a discussion of current and future paths for the development of molecular fMRI. MRI is based on the absorption of radio waves by certain types of atomic nuclei. Protons in water are the most abundant such nuclei, and standard MRI experiments in effect map the distribution of water throughout the body (Nishimura, 1996). MRI signals are also affected by so-called longitudinal and transverse relaxation times, T1 and T2, respectively. Roughly speaking, the shorter T1 is, the more frequently an MRI signal can be measured and the brighter an image will be. The shorter T2 is, the more fleeting each MRI signal is and the darker an image will be. Most hemodynamic fMRI is based on T2 alterations induced by changes in hemoglobin oxygenation (Kwong et al., 1992; Ogawa et al., 1992), and additional hemodynamic techniques rely on T1-related effects caused by changes in blood flow (Detre et al., 1992). MRI molecular imaging agents also work by interacting with water molecules to alter T1 and T2, or in some cases by incorporating nuclei that can be probed using radio frequencies distinct from those used to measure water protons. The first MRI contrast agents, and the most widely used to this day, are small-molecule chelates that incorporate paramagnetic ions like gadolinium (Gd3+) or manganese (Mn2+ or Mn3+) (Lauffer, 1987). Paramagnetic complexes like this are best known for their ability to shorten T1 relaxation, and they are usually called T1 agents (Fig. 2A). The magnitude of their effects is quantified by a magnetic field-dependent parameter called the T1 relaxivity (r1). Gadolinium diethylenetriamine pentaacetic acid (Gd-DTPA) and gadolinium 1,4,7,10-tetraazacyclododecane-1,4,7,10-tetraacetic acid (Gd-DOTA) are prototypical T1 agents, with relaxivity values of 3–5 mm−1 s−1 at moderate to high clinical MRI field strengths (3–7 T) (Kalavagunta et al., 2014; Shen et al., 2015). T1 agents usually need to be present at concentrations >10 μm to be detected, although theoretical studies predict that considerable further improvements in sensitivity might eventually be possible (Caravan et al., 2009). Relaxivity values of paramagnetic chelators depend on a number of molecular parameters, most prominently including the spin number of the paramagnetic species, its solvent interaction characteristics, and its rate of tumbling in solution (Merbach et al., 2013). These parameters can be modulated when a contrast agent interacts with another molecule, forming the basis of a sensing mechanism. Mechanisms of contrast agents for molecular fMRI. Each panel represents a different type of contrast agent, including a typical example of each (left) and its mechanism of influencing MRI signal (right). The MRI signals (right) are produced by sequences of pulses (vertical gray bars), followed by measurement of a signal (black lines); each schematic represents how the MRI signal changes between the absence of the agent (top right) and its presence (bottom right). Text indicates key characteristics of each type of agent. A, T1 agents such as Gd-DTPA (left) usually incorporate a paramagnetic ion (Gd3+, green) and exert effects arising from magnetic dipolar coupling to directly coordinated water molecules (blue). This results in an increase of mean MRI signal observed after during repetition of the MRI pulse sequence (bottom right vs top right). B, T2 agents (left) usually consist of a superparamagnetic mineral core (green) surrounded by a hydrophilic coating (gray). Contrast arises from long-range magnetic interactions with nearby diffusing water molecules (blue). This leads to decreased MRI signal following each individual repetition of the MRI pulse sequence (right). C, CEST agents such as tryptophan (left) incorporate exchangeable protons (green) that absorb radio waves at well-defined, addressable frequencies. A schematic spectrum (left bottom) represents how the frequency associated with the CEST agent (green arrowhead) might differ from that associated with bulk water (blue arrowhead). Application of the MRI pulse sequence in conjunction with radio irradiation of the CEST protons (dark blue box) results in selective reduction of the MRI signal from bulk water protons (right). Adapted from Jasanoff (2007). Magnetic nanoparticles constitute another widely used type of contrast agent (Fig. 2B) (Laurent et al., 2013). Typical magnetic nanoparticles consist of a highly magnetizeable core, usually composed of iron oxide or a related superparamagnetic mineral, surrounded by a layer of hydrophilic molecules that renders the nanoparticle water soluble (Rodriguez et al., 2014). Nanoparticle agents are best known for shortening T2 values and darkening T2-weighted MRI scans. The influence of these agents is indicated by their T2 relaxivity (r2), which depends most prominently on the size of the particle and the thickness of its coating. Magnetic nanoparticles often have r2 values >100 (mm metal)−1 s−1, and can be detected at metal concentrations <10 μm; because there are typically >1000 metal atoms per nanoparticle core, this translates into particle concentrations <10 nm. Effective changes in nanoparticle size and therefore r2 can be produced by inducing particle clustering (Perez et al., 2002), and this has formed the basis of several nanoparticle-based MRI sensors. The drawback of this approach is that clustering is a relatively slow and uncontrolled molecular mechanism (Shapiro et al., 2006). Diamagnetic molecules have been increasingly used as MRI imaging agents in recent years. A key advantage of diamagnetic molecular MRI agents over paramagnetic chelates and nanoparticles is that they tend to be more biocompatible, and that in some cases endogenous molecules be used (Liu et al., 2013). Molecules suitable for such applications absorb radio waves at characteristic frequencies, a bit like optical dyes, allowing them to be probed directly by MRI hardware and visualized as distinct “colors.” Normally, such species are too dilute to be measured robustly by MRI, but two techniques have been used to boost the sensitivity of their detection. In a first approach, the MRI signals from diamagnetic molecules are boosted artificially, sometimes by factors of >104, using so-called hyperpolarization techniques (Taratula and Dmochowski, 2010; Meier et al., 2014). The substances can then be injected into or in some cases inhaled by the subject and imaged before effects of the hyperpolarization fade away, usually within seconds to minutes. In the second approach, called chemical exchange saturation transfer (CEST) (Fig. 2C), the effects of radiofrequency absorbance by a diamagnetic agent are amplified by a rapid process of physical exchange between atoms on the agent and a much larger pool of atoms in the surrounding solvent (Ward et al., 2000). This allows MRI to visualize CEST agents at concentrations typically in the millimolar range (van Zijl and Yadav, 2011). Genetically encoded biomolecular MRI probes represent what may be considered a fourth class of molecular imaging agents, although in each case they work by one or more of the mechanisms discussed above but warrant special consideration because of their potential for truly noninvasive endogenous production of probes in animals. Paramagnetic metalloproteins are the nearest biosynthetic equivalent to T1 and T2 contrast agents (Matsumoto and Jasanoff, 2013). Both natural and engineered metalloproteins have been harnessed to act as MRI sensors. Most metalloproteins contain a small number of bound metal ions and display characteristics similar to T1 agents. An exception is the protein ferritin, which forms a roughly spherical shell of 24 protein subunits surrounding a small mineral core of weakly magnetic hydrated iron oxide. This enables ferritin to function as a protein-based magnetic nanoparticle, but with relaxivity much lower than synthetic analogs (Gillis and Koenig, 1987; Gossuin et al., 2002). Biosynthetic magnetic nanoparticles called magnetosomes are also formed by so-called magnetotactic bacteria (Schüler, 2007). Magnetosomes are actually tiny organelles, composed of protein elements in a lipid membrane that surrounds a superparamagnetic core similar to synthetic magnetic nanoparticles. Engineered proteins and peptides have also been shown to act as diamagnetic CEST agents detectable by MRI. In some cases, these species have addressed the intrinsic sensitivity limitations of CEST contrast by combining many monomeric CEST agents into a single biopolymer (Bar-Shir et al., 2015). Future development of molecular fMRI will depend on effective application of MRI probe architectures to the measurement of well-defined signaling events in the brain. In the next sections, we will discuss past efforts and future prospects for using MRI probes to target three types of dynamic neural signals: neurotransmitter release, intracellular calcium ions, and gene expression changes. One of the most obvious ways to measure functionally specific information from the brain is to use imaging agents to target individual neurotransmitters, several of which play relatively defined roles in neural processing. A number of molecular MRI strategies have been introduced to accomplish this. The dopamine imaging agent used in the Lee et al. (2014) molecular fMRI study is an engineered protein based on a cytochrome P450 heme domain, BM3h; variants of the same protein have also been produced for molecular imaging of serotonin and norepinephrine (Brustad et al., 2012). These contrast agents act as T1 agents with relaxivities of ∼1 mm−1 s−1, and they can detect neurotransmitters at low micromolar concentrations (Shapiro et al., 2010). Additional T1 contrast agents have been developed to target amino acid transmitters. Oukhatar et al. (2015) synthesized a complex that combines a crown ether cation-binding motif with a gadolinium chelator capable of coordinating an additional carboxylate moiety. The resulting complexes displayed millimolar affinity for glutamate, GABA, and glycine, and neurotransmitter binding was accompanied by r1 changes of up to 81% in buffer. Another T1 agent synthesized by Mishra et al. (2013) was designed to sense glutamate by a mechanism involving competitive binding to mGluR5 receptors, somewhat like receptor displacement approaches used for PET (Laruelle, 2000). This probe bound to mGluR5-expressing cells in culture and produced MRI-detectable T1 changes at micromolar concentrations in vitro. In another indirect approach, our laboratory used a zinc-sensitive MRI agent to label cells that corelease zinc ions with glutamate at synapses (Lee et al., 2010b). We observed approximately twofold more pronounced staining of neural tissue when we injected this probe into the hippocampus, where zinc functions as a glutamate cotransmitter, than into the striatum, which contains little extracellular zinc. The only MRI-based neurotransmitter imaging method that has so far been demonstrated in human subjects is the probe-independent approach of using endogenous glutamate itself for detection by CEST MRI (Cai et al., 2012). A relatively specific CEST signal can be obtained using radio irradiation at a frequency corresponding to the exchangeable amine protons of glutamate. The approach was recently applied in a small study of epileptic patients among which an excess CEST signal of ∼1% correlated with lateralized temporal lobe seizure foci (Davis et al., 2015). Mechanistic interpretation of these results is complicated by the fact that glutamate-dependent CEST signals are contaminated by pH effects and other metabolites, and also because the approach does not differentiate between extracellular and intracellular glutamate concentrations. The fact that the CEST contrast in this approach arises entirely from endogenous factors makes it difficult to design controls for ruling out glutamate-independent sources. Nevertheless, evidence from in vivo glutamate magnetic resonance spectroscopy studies suggests that dynamic brain activation-related changes in glutamate signals could in principle be detectable at relatively low resolution and on a timescale of minutes (Bednařík et al., 2015). Although neurotransmitter-sensitive molecular fMRI techniques can yield useful information under some conditions, the current methods come up short against the capabilities one would ideally want. Neurotransmitter concentrations in the brain vary widely in concentration and dynamics but are mostly out of range of current imaging strategies. Resting interstitial dopamine levels are generally ∼0.1 μm and during naturalistic behavior can fluctuate to levels up to 1–2 μm on time scales approximately one-tenth of a second (Taylor et al., 2015) (compare detection limit of 2 μm dopamine with 8 s acquisition for BM3h-based agents) (Lee et al., 2014). Basal parenchymal glutamate and GABA concentrations are similar to dopamine but tend to fluctuate on a much faster time scale, with peak concentrations that rarely exceed 1 μm (Slaney et al., 2012). An MRI probe well suited to detecting these kinds of dynamics should ideally be present at concentrations below the mid-nanomolar range, a regimen that is currently most accessible to nanoparticle-based contrast agents. A task for molecular engineers should therefore be to construct neurotransmitter sensors that escape some of the traditional limitations of nanoparticle-based probes, such as slow transport and response kinetics (Rodriguez et al., 2014). Delivery of such agents to the brain will also be challenging, but noninvasive brain delivery methods are more feasible for sensors that work at lower concentrations (Lelyveld et al., 2011). Intracellular calcium concentrations are currently the favored target for functional neuroimaging using optical methods, and for good reason. Cytosolic Ca2+ fluctuations extend from basal concentrations near 0.1 μm to levels as high as 10 μm near synapses and are already so heavily buffered in cells that addition of calcium indicators produces minimal perturbation of calcium-mediated signaling processes (Meldolesi, 2002). Powerful small molecule fluorescent sensors for calcium have been available since the 1980s (Grynkiewicz et al., 1985; Tsien et al., 1985); and after many successive stages of refinement, genetically encoded GFP-based calcium indicators descended from those introduced in the late 1990s are now also in wide use (Miyawaki et al., 1997; Nagai et al., 2001; Rose et al., 2014). Given this precedent, the development of calcium-dependent molecular fMRI methods is an obvious priority. Several groups have worked on calcium imaging approaches for MRI using different strategies, but these have not yet proved successful molecular fMRI. The activity-dependent manganese labeling methods of Koretsky and colleagues provide a calcium-related MRI readout, but for biokinetic reasons discussed above, cannot achieve real-time imaging (Lin and Koretsky, 1997; Inoue et al., 2011). The first T1-based small molecule calcium sensor was a compound called Gd-DOPTA, reported ∼15 years ago by Li et al. (2002). This agent is a small BAPTA-based gadolinium complex that responds to Ca2+ increases near an EC50 of 1 μm with an r1 change from 3.3 to 5.8 mm−1 s−1 at a field of 11.7 T. In principle, this agent should be close to ideal for intracellular calcium ion imaging, but its delivery into cells could be complicated by the highly polar nature of the Gd3+ chelating groups it contains. Future applications of these kinds of compounds could follow either from combining the compounds with cell delivery strategies (Bhorade et al., 2000; Hung et al., 2014) or by synthesizing contrast agents from building blocks that are themselves cell permeable (Zhang et al., 2007; Lee et al., 2010b). Angelovski and colleagues (Angelovski et al., 2008; Dhingra et al., 2008) have sought to avoid the need for intracellular delivery by producing compounds similar to Gd-DOPTA, but tuned to detect extracellular calcium changes in the brain. This bypasses the requirement for membrane permeability but targets a phenomenon of less direct association with neural activity. These authors have generated a series of calcium probes with affinities in the mid-micromolar to millimolar range, including molecules that work by both relaxation-based and spectroscopic mechanisms (Angelovski et al., 2011; Kadjane et al., 2014). Several of these probes involve fusion of Gd-DOTA-based macrocyclic complexes to the calcium chelator EGTA. In recent work, one such complex was fused to a diamagnetic polysiloxane nanoparticle platform to produce slow-clearing contrast agents that display r1 changes from 3.6 to 7.0 mm−1 s−1 upon calcium binding with a Kd of 1.9 mm (Moussaron et al., 2015). The authors injected these agents intravenously in mice, either with or without a subsequent injection of intravascular CaCl2 solution. They found ∼30% average T1-weighted contrast enhancement differences in the kidney, contingent on the CaCl2; this was the first time calcium responses have been demonstrated using an MRI calcium sensor in vivo, albeit not yet in the brain. Our own group has introduced highly sensitive nanoparticle-based calcium probes that produce more than threefold changes in T2 upon calcium binding in buffer (Atanasijevic et al., 2006). This permits detection of Ca2+ ions with a binding midpoint of 1.4 μm at nanosensor concentrations ∼1 nm (90 μm total Fe). A drawback of the prototype sensor was its large size and slow multimolecular response mechanism, which depends on reversible nanoparticle clustering (Perez et al., 2002; Shapiro et al., 2006). In a second-generation calcium nanosensor, however, we were able to demonstrate sensor responses that take place within seconds by using smaller nanoparticles (Rodriguez et al., 2014). An obvious problem with nanoparticle-based MRI sensors for intracellular Ca2+ is again the difficulty of delivering them to the brain and into cells. An intriguing direction for future development of this approach is to try to genetically encode the entire sensor, producing nanoparticle components inside cells in the form of engineered ferritin-based proteins. The same clustering mechanism that actuates synthetic nanoparticle sensors can be implemented using ferritin (Bennett et al., 2008; Shapiro et al., 2009). We recently showed that clustering of genetically expressed ferritin fusion proteins can be induced inside cells and also produces MRI-detectable T2 changes (Matsumoto et al., 2015); this constitutes a key proof of concept for intracellular ferritin-based sensor strategies. Gene reporters are not the most obvious tools for functional brain imaging, and current reporter technologies certainly cannot operate at the speed of thought. But the utility of techniques such as c-Fos immunohistochemistry and more recent improved equivalents (Barth, 2007; Kovács, 2008) nevertheless provides inspiration for the possibility of using MRI-detectable genetic reporters as tools for neural activity mapping by noninvasive imaging (Jasanoff, 2005). Genetic reporters for MRI could also be useful for monitoring plasticity or development. Although the spatial resolution of MRI readouts is far worse than the histochemical techniques used to detect immediate early gene activation optically, the key advantage of MRI is the potential to image repeatedly in individual animals, either to compare responses among different conditions or to perform longitudinal studies. An added benefit with respect to hemodynamic or molecular fMRI could be the possibility of performing gene induction experiments in awake, behaving animals, rather than in the restrictive environment of the scanner. More than 20 specific molecular mechanisms for MRI-based detection of reporter gene expression have been proposed (Srivastava et al., 2015). Many of these require the interaction between a reporter gene product and a contrast agent substrate or ligand. Ideally, an MRI reporter would avoid the use of a cofactor, both because of the added complexity this introduces and because of the potential difficulty of delivering of the cofactor adequately to the brain. The simplest MRI reporter gene detection methods involve the expression of a single protein, which may be incorporated into transgenic or virally transduced animals. In this light, a handful of MRI reporter genes deserve special mention. The family of MRI reporter genes that has been most widely explored to date are the ferritins. Papers from the laboratories of Eric Ahrens and Michal Neeman first demonstrated that human ferritin overexpression in cultured cells and small animals could lead to discernible MRI contrast changes, including in brain (Cohen et al., 2005, 2007; Genove et al., 2005). Protein engineering has produced ferritins that show improved detectability (Iordanova et al., 2010; Matsumoto et al., 2015). Currently available ferritin reporters still appear to be unreliable in vivo, however (Bernau et al., 2015; Pereira et al., 2015). Further efforts to improve the magnetization and iron content of ferritins may therefore be critical to transforming these proteins into truly robust reporters for MRI molecular imaging (Matsumoto et al., 2015). Another approach to generating metal-dependent contrast has been to use metal ion transporters as MRI reporters. Because of their enzymatic action, metal transporters could be more effective than ferritins at promoting cellular metal accumulation and consequent MRI contrast (Goldhawk et al., 2009; Paproski et al., 2011; Bartelle et al., 2013). The most promising results to date in brain have come from overexpression of the divalent metal transporter DMT1, in combination with injection of substrate manganese ions, which can be injected peripherally (Bartelle et al., 2013). These studies showed that in vivo transduction of neonatal mouse brain regions with the DMT1 gene gives rise to selective manganese-enhanced T1 changes by up to 26%. For MRI-based detection of gene expression, genetically encoded diamagnetic CEST reporters have special advantages. These proteins do not induce cellular metal accumulation or interact with homeostatic processes, and they are therefore less likely to be toxic than ferritins or metal transporters. In addition, the fact that CEST reporters become MRI-visible immediately upon biosynthesis could make these proteins better suited to time-resolved studies of gene regulation. The first reporter gene detectable by CEST imaging was an artificial lysine-rich protein, engineered to combat sensitivity limitations of CEST contrast by including a particularly high number of equivalent exchangeable protons (Gilad et al., 2007). The authors showed that implanted cells overexpressing this protein give rise to an ∼5% change in image signal with respect to controls in brain. Although CEST-like contrast can arise from endogenous sources, the authors compared their construct with a control expression vector to rule out such nonspecific effects. Further improvements to CEST-based genetic reporters have been possible by screening peptide sequences and alternative protein platforms for enhanced CEST contrast (Bar-Shir et al., 2015). If further sensitivity gains are forthcoming, diamagnetic CEST reporters could offer unique potential for noninvasive activity-dependent reporter gene mapping with minimal disruption to neural systems. In conclusion, molecular fMRI is a new experimental approach that combines noninvasive whole-brain imaging with molecular probe-mediated readouts of specific mechanistic components of brain function. In the past several years, there have been important demonstrations of the feasibility of molecular fMRI-based mapping of neural activity and related phenomena in the brain (Table 1). The technology is still rudimentary, but there are a number of promising directions for future research, in particular involving the development of improved chemical and genetic MRI contrast agents for imaging neurotransmitters, calcium ions, and gene expression, as well as probes that detect previously unaddressed neurophysiological parameters, such as membrane potential. The overarching need is for imaging agents that offer better sensitivity than currently available, and for effective strategies to deliver these probes to their sites of action in cells or brain tissue. Advances in these two areas will be critical to the potential use of molecular fMRI methods in human subjects. An ideal combination of nanomolar sensitivity, subsecond response times, and BBB permeability might best be realized by combining high relaxivity T1 or T2 agents with minimally invasive brain delivery strategies, such as receptor-mediated trans-BBB transport (Pardridge, 2015). This will require substantial further molecular engineering of existing probe building blocks, or perhaps as an alternative, the introduction of entirely new principles for operation of molecular fMRI probes. For applications in animals, brain delivery using intracranial injection or BBB disruption strategies could be acceptable in place of completely noninvasive strategies (Kroll and Neuwelt, 1998; Vykhodtseva et al., 2008). As new probes become available, it will be important to perform rigorous validation studies. It is critical in each case to rule out alternative probe-independent explanations for apparent molecular fMRI signal changes, such as endogenous changes in T1 or T2 relaxation rates or side effects of probe injection; in some cases, mislocalization or inactivation of probes might pose an additional complication. These factors can generally be controlled for by performing experiments with analyte-insensitive probe variants (as in Fig. 1B) and by comparing molecular fMRI data with independent measurements of the same biological targets (e.g., using optical imaging or electrochemistry) (Lee et al., 2014). In some cases, future validation and use of molecular fMRI techniques may also benefit from suppression of probe-independent endogenous MRI signals, for instance by using pharmacological techniques to reduce hemodynamic effects (Bruhn et al., 2001; Stefanovic et al., 2006, 2007). To realize the full potential of molecular fMRI, improvements in probe technology must also be accompanied by improvements in hardware. For instance, improved spatiotemporal resolution is possible by combining multiple MRI detection circuits for so-called parallel imaging, but this approach has yet to be applied to full extent for small animal imaging (Feinberg and Setsompop, 2013). Cellular resolution (<20 μm) molecular fMRI can probably eventually be achieved but will likely depend also on access to MRI scanners operating at ≥20 T, which are not yet routinely available; a theoretical ceiling of ∼2 μm on resolution arises from the dependence of proton MRI on the diffusion of water molecules (Callaghan, 1993). Unprecedented molecular-level brain mapping experiments are already possible using today's scanners and imaging probes, however, suggesting that the continuing development of molecular fMRI technology will remain a rewarding direction for our field. The authors acknowledge support from NIH Grants R21-MH102470 and U01-NS090451 (BRAIN Initiative), and Massachusetts Institute of Technology Simons Center for the Social Brain seed grant. (2013) Whole-brain functional imaging at cellular resolution using light-sheet microscopy. Nat Methods 10:413–420, doi:10.1038/nmeth.2434, pmid:23524393. (2008) Smart magnetic resonance imaging agents that sense extracellular calcium fluctuations. Chembiochem 9:1729–1734, doi:10.1002/cbic.200800165, pmid:18604834. (2011) Calcium-responsive paramagnetic CEST agents. Bioorg Med Chem 19:1097–1105, doi:10.1016/j.bmc.2010.07.023, pmid:20691598. (2006) Calcium-sensitive MRI contrast agents based on superparamagnetic iron oxide nanoparticles and calmodulin. Proc Natl Acad Sci U S A 103:14707–14712, doi:10.1073/pnas.0606749103, pmid:17003117. (2005) Direct detection of neuronal activity with MRI: Fantasy, possibility, or reality? Appl Magn Reson 29:65–88, doi:10.1007/BF03166956, pmid:17038505. (2014) Brain Research through Advancing Innovative Neurotechnologies (BRAIN) (National Institutes of Health, Bethesda, MD). (2015) Molecular engineering of nonmetallic biosensors for CEST MRI. ACS Chem Biol 10:1160–1170, doi:10.1021/cb500923v, pmid:25730583. (2013) Divalent metal transporter, DMT1: a novel MRI reporter protein. Magn Reson Med 70:842–850, doi:10.1002/mrm.24509, pmid:23065715. (2007) Visualizing circuits and systems using transgenic reporters of neural activity. Curr Opin Neurobiol 17:567–571, doi:10.1016/j.conb.2007.10.003, pmid:18036810. (2015) Neurochemical and BOLD responses during neuronal activation measured in the human visual cortex at 7 Tesla. J Cereb Blood Flow Metab 35:601–610, doi:10.1038/jcbfm.2014.233, pmid:25564236. (1991) Functional mapping of the human visual cortex by magnetic resonance imaging. Science 254:716–719. (2009) Neural correlates of interspecies perspective taking in the post-mortem Atlantic Salmon: an argument for multiple comparisons correction. Neuroimage 47(Suppl 1):S125. (2008) Controlled aggregation of ferritin to modulate MRI relaxivity. Biophys J 95:342–351, doi:10.1529/biophysj.107.116145, pmid:18326661. (2015) In vivo tracking of human neural progenitor cells in the rat brain using magnetic resonance imaging is not enhanced by ferritin expression. Cell Transplant pmid:26160767, Advance online publication. Retrieved Jul. 8, 2015. (2000) Macrocyclic chelators with paramagnetic cations are internalized into mammalian cells via a HIV-tat derived membrane translocation peptide. Bioconjug Chem 11:301–305, doi:10.1021/bc990168d, pmid:10821645. (2001) Modulation of cerebral blood oxygenation by indomethacin: MRI at rest and functional brain activation. J Magn Reson Imaging 13:325–334, doi:10.1002/jmri.1047, pmid:11241803. (2012) Structure-guided directed evolution of highly selective p450-based magnetic resonance imaging sensors for dopamine and serotonin. J Mol Biol 422:245–262, doi:10.1016/j.jmb.2012.05.029, pmid:22659321. (2012) Magnetic resonance imaging of glutamate. Nat Med 18:302–306, doi:10.1038/nm.2615, pmid:22270722. (1993) Principles of nuclear magnetic resonance microscopy (Oxford Science, Oxford). (2009) Influence of molecular parameters and increasing magnetic field strength on relaxivity of gadolinium- and manganese-based T1 contrast agents. Contrast Media Mol Imaging 4:89–100, doi:10.1002/cmmi.267, pmid:19177472. (2013) Imaging neuronal populations in behaving rodents: paradigms for studying neural circuits underlying behavior in the mammalian cortex. J Neurosci 33:17631–17640, doi:10.1523/JNEUROSCI.3255-13.2013, pmid:24198355. (1997) Detection of dopaminergic neurotransmitter activity using pharmacologic MRI: correlation with PET, microdialysis, and behavioral data. Magn Reson Med 38:389–398, doi:10.1002/mrm.1910380306, pmid:9339439. (2005) Ferritin as an endogenous MRI reporter for noninvasive imaging of gene expression in C6 glioma tumors. Neoplasia 7:109–117, doi:10.1593/neo.04436, pmid:15802016. (2007) MRI detection of transcriptional regulation of gene expression in transgenic mice. Nat Med 13:498–503, doi:10.1038/nm1497, pmid:17351627. (2006) in Functional MRI: Basic principles and clinical applications, Challenges in fMRI and its limitations, eds Faro SH, Mohamed FB (Springer, New York), pp 75–98. (2015) Glutamate imaging (GluCEST) lateralizes epileptic foci in nonlesional temporal lobe epilepsy. Sci Transl Med 7:309ra161, doi:10.1126/scitranslmed.aaa7095, pmid:26468323. (2011) Mapping brain networks in awake mice using combined optical neural control and fMRI. J Neurophysiol 105:1393–1405, doi:10.1152/jn.00828.2010, pmid:21160013. (1992) Perfusion imaging. Magn Reson Med 23:37–45, doi:10.1002/mrm.1910230106, pmid:1734182. (2008) Towards extracellular Ca2+ sensing by MRI: synthesis and calcium-dependent 1H and 17O relaxation studies of two novel bismacrocyclic Gd3+ complexes. J Biol Inorg Chem 13:35–46, doi:10.1007/s00775-007-0269-9, pmid:17874148. (2003) Microvascular BOLD contribution at 4 and 7 T in the human brain: gradient-echo and spin-echo fMRI with suppression of blood effects. Magn Reson Med 49:1019–1027, doi:10.1002/mrm.10472, pmid:12768579. (2013) Ultra-fast MRI of the human brain with simultaneous multi-slice imaging. J Magn Reson 229:90–100, doi:10.1016/j.jmr.2013.02.002, pmid:23473893. (2005) A new transgene reporter for in vivo magnetic resonance imaging. Nat Med 11:450–454, doi:10.1038/nm1208, pmid:15778721. (2007) Artificial reporter gene providing MRI contrast based on proton exchange. Nat Biotech 25:217–219, doi:10.1038/nbt1277, pmid:17259977. (2011) Overview of functional magnetic resonance imaging. Neurosurg Clin North Am 22:133–139, doi:10.1016/j.nec.2010.11.001, pmid:21435566. (2009) Magnetic resonance imaging of cells overexpressing MagA, an endogenous contrast agent for live cell imaging. Mol Imaging 8:129–139, pmid:19723470. (1985) A new generation of Ca2+ indicators with greatly improved fluorescence properties. J Biol Chem 260:3440–3450, pmid:3838314. (2015) Cellular level brain imaging in behaving mammals: an engineering approach. Neuron 86:140–159, doi:10.1016/j.neuron.2015.03.055, pmid:25856491. (2014) Coupling mechanism and significance of the BOLD signal: a status report. Annu Rev Neurosci 37:161–181, doi:10.1146/annurev-neuro-071013-014111, pmid:25032494. (2012) Calibrated FMRI. Neuroimage 62:930–937, doi:10.1016/j.neuroimage.2012.02.022, pmid:22369993. (2014) Graphene oxide enhances cellular delivery of hydrophilic small molecules by co-incubation. ACS Nano 8:10168–10177, doi:10.1021/nn502986e, pmid:25226566. (2012) Quantitative fMRI and oxidative neuroenergetics. Neuroimage 62:985–994, doi:10.1016/j.neuroimage.2012.04.027, pmid:22542993. (2011) Manganese enhanced MRI (MEMRI): neurophysiological applications. Rev Neurosci 22:675–694, doi:10.1515/RNS.2011.048, pmid:22098448. (2010) Design and characterization of a chimeric ferritin with enhanced iron loading and transverse NMR relaxation rate. J Biol Inorg Chem 15:957–965, doi:10.1007/s00775-010-0657-7, pmid:20401622. (2005) Functional MRI using molecular imaging agents. Trends Neurosci 28:120–126, doi:10.1016/j.tins.2004.12.007, pmid:15749164. (2007) MRI contrast agents for functional molecular imaging of brain activity. Curr Opin Neurobiol 17:593–600, doi:10.1016/j.conb.2007.11.002, pmid:18093824. (2014) Dual-frequency calcium-responsive MRI agents. Chemistry 20:7351–7362, doi:10.1002/chem.201400159, pmid:24796323. (2014) In-vitro Gd-DTPA relaxometry studies in oxygenated venous human blood and aqueous solution at 3 and 7T. Contrast Media Mol Imaging 9:169–176, doi:10.1002/cmmi.1568, pmid:24523062. (2008) Measurement of immediate-early gene activation: c-fos and beyond. J Neuroendocrinol 20:665–672, doi:10.1111/j.1365-2826.2008.01734.x, pmid:18601687. (1998) Outwitting the blood–brain barrier for therapeutic purposes: osmotic opening and other means. Neurosurgery 42:1083–1099, doi:10.1097/00006123-199805000-00082, pmid:9588554, discussion 1099–1100. (1992) Dynamic magnetic resonance imaging of human brain activity during primary sensory stimulation. Proc Natl Acad Sci U S A 89:5675–5679, doi:10.1073/pnas.89.12.5675, pmid:1608978. (2000) Imaging synaptic neurotransmission with in vivo binding competition techniques: a critical review. J Cereb Blood Flow Metab 20:423–451, doi:10.1097/00004647-200003000-00001, pmid:10724107. (1997) Imaging D2 receptor occupancy by endogenous dopamine in humans. Neuropsychopharmacology 17:162–174, doi:10.1016/S0893-133X(97)00043-2, pmid:9272483. (1987) Paramagnetic metal complexes as water proton relaxation agents for NMR imaging: theory and design. Chem Rev 87:901–927, doi:10.1021/cr00081a003. (2013) The chemistry of contrast agents in medical magnetic resonance imaging, Superparamagnetic iron oxide nanoparticles for MRI (Wiley, New York). (2007) The “wet mind”: water and functional neuroimaging. Phys Med Biol 52:R57–R90, doi:10.1088/0031-9155/52/7/R02, pmid:17374909. (2010a) Global and local fMRI signals driven by neurons defined optogenetically by type and wiring. Nature 465:788–792, doi:10.1038/nature09108, pmid:20473285. (2010b) In vivo imaging with a cell-permeable porphyrin-based MRI contrast agent. Chem Biol 17:665–673, doi:10.1016/j.chembiol.2010.05.009, pmid:20609416. 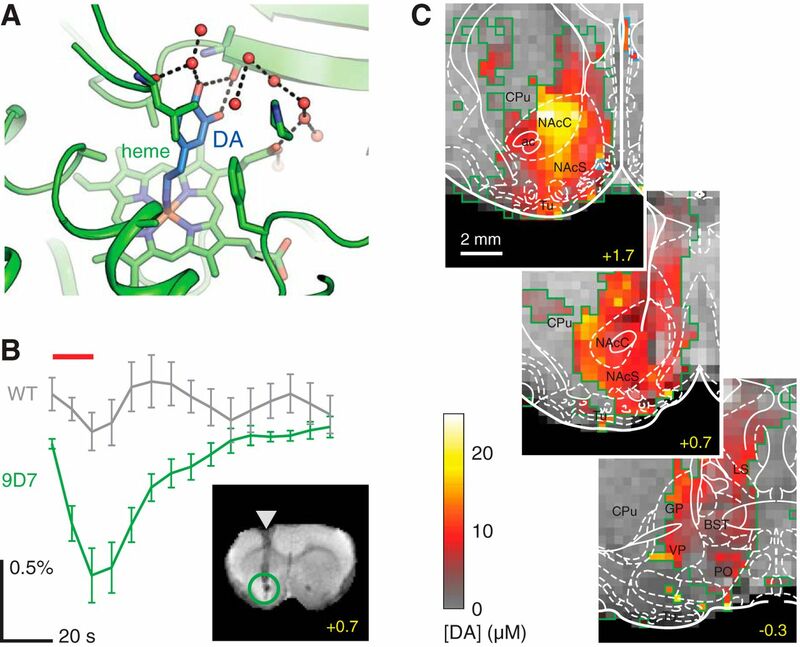 (2014) Molecular-level functional magnetic resonance imaging of dopaminergic signaling. Science 344:533–535, doi:10.1126/science.1249380, pmid:24786083. (2011) Metal-substituted protein MRI contrast agents engineered for enhanced relaxivity and ligand sensitivity. J Am Chem Soc 133:649–651, doi:10.1021/ja107936d, pmid:21171606. (2002) Mechanistic studies of a calcium-dependent MRI contrast agent. Inorg Chem 41:4018–4024, doi:10.1021/ic0200390, pmid:12132928. (1997) Manganese ion enhances T1-weighted MRI during brain activation: an approach to direct imaging of brain function. Magn Reson Med 38:378–388, doi:10.1002/mrm.1910380305, pmid:9339438. (2013) Nuts and bolts of CEST MR imaging. NMR Biomed 26:810–828, doi:10.1002/nbm.2899, pmid:23303716. (2008) What we can do and what we cannot do with fMRI. Nature 453:869–878, doi:10.1038/nature06976, pmid:18548064. (2001) Neurophysiological investigation of the basis of the fMRI signal. Nature 412:150–157, doi:10.1038/35084005, pmid:11449264. (2009) Metabolic and hemodynamic events after changes in neuronal activity: current hypotheses, theoretical predictions and in vivo NMR experimental findings. J Cereb Blood Flow Metab 29:441–463, doi:10.1038/jcbfm.2008.134, pmid:19002199. (2011) Manganese-enhanced magnetic resonance imaging (MEMRI). Methods Mol Biol 711:145–174, doi:10.1007/978-1-61737-992-5_7, pmid:21279601. (2013) Metalloprotein-based MRI probes. FEBS Lett 587:1021–1029, doi:10.1016/j.febslet.2013.01.044, pmid:23376346. (2015) Engineering intracellular biomineralization and biosensing by a magnetic protein. Nat Commun 6:8721, doi:10.1038/ncomms9721, pmid:26522873. (2014) Hyperpolarized NMR probes for biological assays. Sensors (Basel) 14:1576–1597, doi:10.3390/s140101576, pmid:24441771. (2002) Rapidly exchanging Ca2+ stores: ubiquitous partners of surface channels in neurons. Physiology 17:144–149, doi:10.1152/nips.01385.2002. (2013) The chemistry of contrast agents in medical magnetic resonance imaging, Relaxivity of gadolinium(III) complexes: theory and mechanism (Wiley, New York), Ed 2. (2013) Microscopic visualization of metabotropic glutamate receptors on the surface of living cells using bifunctional magnetic resonance imaging probes. ACS Chem Neurosci 5:128–137, doi:10.1021/cn400175m, pmid:24251400. (1997) Fluorescent indicators for Ca2+ based on green fluorescent proteins and calmodulin. Nature 388:882–887, doi:10.1038/42264, pmid:9278050. (2015) Ultrasmall nanoplatforms as calcium-responsive contrast agents for magnetic resonance imaging. Small 11:4900–4909, doi:10.1002/smll.201500312, pmid:26179212. (1996) Principles of magnetic resonance imaging (Stanford University, Stanford, CA). (1992) Intrinsic signal changes accompanying sensory stimulation: functional brain mapping with magnetic resonance imaging. Proc Natl Acad Sci U S A 89:5951–5955, doi:10.1073/pnas.89.13.5951, pmid:1631079. (2015) MRI sensing of neurotransmitters with a crown ether appended Gd(3+) complex. ACS Chem Neurosci 6:219–225, doi:10.1021/cn500289y, pmid:25496344. (2011) Tyrosinase as a dual reporter gene for both photoacoustic and magnetic resonance imaging. Biomed Opt Express 2:771–780, doi:10.1364/BOE.2.000771, pmid:21483602. (2015) Targeted delivery of protein and gene medicines through the blood–brain barrier. Clin Pharmacol Ther 97:347–361, doi:10.1002/cpt.18, pmid:25669455. (2006) Biological applications of manganese-enhanced magnetic resonance imaging. Methods Mol Med 124:365–386, pmid:16506430. (2015) Overexpression of the MRI reporter genes ferritin and transferrin receptor affect iron homeostasis and produce limited contrast in mesenchymal stem cells. Int J Mol Sci 16:15481–15496, doi:10.3390/ijms160715481, pmid:26184159. (2002) DNA-based magnetic nanoparticle assembly acts as a magnetic relaxation nanoswitch allowing screening of DNA-cleaving agents. J Am Chem Soc 124:2856–2857, doi:10.1021/ja017773n, pmid:11902860. (2014) Magnetic nanosensors optimized for rapid and reversible self-assembly. Chem Commun (Camb) 50:3595–3598, doi:10.1039/c4cc00314d, pmid:24566735. (2014) Putting a finishing touch on GECIs. Front Mol Neurosci 7:88, doi:10.3389/fnmol.2014.00088, pmid:25477779. (2012) fMRI at 20: has it changed the world? Neuroimage 62:1316–1324, doi:10.1016/j.neuroimage.2012.03.004, pmid:22433659. (2013) Brain-wide 3D imaging of neuronal activity in Caenorhabditis elegans with sculpted light. Nat Methods 10:1013–1020, doi:10.1038/nmeth.2637, pmid:24013820. (2007) Magnetoreception and magnetosomes in bacteria (Springer, Berlin). (2006) Dynamic imaging with MRI contrast agents: quantitative considerations. Magn Reson Imaging 24:449–462, doi:10.1016/j.mri.2005.12.033, pmid:16677952. (2009) Protein nanoparticles engineered to sense kinase activity in MRI. J Am Chem Soc 131:2484–2486, doi:10.1021/ja8086938, pmid:19199639. (2010) Directed evolution of a magnetic resonance imaging contrast agent for noninvasive imaging of dopamine. Nat Biotechnol 28:264–270, doi:10.1038/nbt.1609, pmid:20190737. (2015) T1 relaxivities of gadolinium-based magnetic resonance contrast agents in human whole blood at 1.5, 3, and 7 T. Invest Radiol 50:330–338, doi:10.1097/RLI.0000000000000132, pmid:25658049. (2011) Longitudinal functional magnetic resonance imaging in animal models. Methods Mol Biol 711:281–302, doi:10.1007/978-1-61737-992-5_14, pmid:21279608. (2013) Chemical gradients within brain extracellular space measured using low flow push-pull perfusion sampling in vivo. ACS Chem Neurosci 4:321–329, doi:10.1021/cn300158p, pmid:23421683. (2012) Brain imaging: fMRI 2.0. Nature 484:24–26, doi:10.1038/484024a, pmid:22481337. (2015) Advances in using MRI probes and sensors for in vivo cell tracking as applied to regenerative medicine. Dis Model Mech 8:323–336, doi:10.1242/dmm.018499, pmid:26035841. (2006) Modulatory role of cyclooxygenase-2 in cerebrovascular coupling. Neuroimage 32:23–32, doi:10.1016/j.neuroimage.2006.03.014, pmid:16626973. (2007) Functional uncoupling of hemodynamic from neuronal response by inhibition of neuronal nitric oxide synthase. J Cereb Blood Flow Metab 27:741–754, doi:10.1038/sj.jcbfm.9600377, pmid:16883353. (2010) Functionalized 129Xe contrast agents for magnetic resonance imaging. Curr Opin Chem Biol 14:97–104, doi:10.1016/j.cbpa.2009.10.009, pmid:19914122. (2015) Kinetic diversity of dopamine transmission in the dorsal striatum. J Neurochem 133:522–531, doi:10.1111/jnc.13059, pmid:25683259. (2005) Mapping cortical activity elicited with electrical microstimulation using FMRI in the macaque. Neuron 48:901–911, doi:10.1016/j.neuron.2005.11.034, pmid:16364895. (1985) Measurement of cytosolic free Ca2+ in individual small cells using fluorescence microscopy with dual excitation wavelengths. Cell Calcium 6:145–157, doi:10.1016/0143-4160(85)90041-7, pmid:3874696. (2012) Development of functional imaging in the human brain (fMRI): the University of Minnesota experience. Neuroimage 62:613–619, doi:10.1016/j.neuroimage.2012.01.135, pmid:22342875. (2011) Chemical Exchange Saturation Transfer (CEST): what is in a name and what isn't? Magn Reson Med 65:927–948, doi:10.1002/mrm.22761, pmid:21337419. (2008) Progress and problems in the application of focused ultrasound for blood–brain barrier disruption. Ultrasonics 48:279–296, doi:10.1016/j.ultras.2008.04.004, pmid:18511095. (2000) A new class of contrast agents for MRI based on proton chemical exchange dependent saturation transfer (CEST). J Magn Reson 143:79–87, doi:10.1006/jmre.1999.1956, pmid:10698648. (2014) Deciphering laminar-specific neural inputs with line-scanning fMRI. Nat Methods 11:55–58, doi:10.1038/nmeth.2730, pmid:24240320. (2007) Water-soluble porphyrins as a dual-function molecular imaging platform for MRI and fluorescence zinc sensing. Proc Natl Acad Sci U S A 104:10780–10785, doi:10.1073/pnas.0702393104, pmid:17578918.